Hailed as one of the cheapest Michelin starred meals you can get in the world, Tim Ho Wan has been an extremely popular dim sum place in Hong Kong since seemingly forever ago. More recently, they have expanded to many parts of Asia, including Singapore, Malaysia, the Philippines, and most recently, Taiwan (they are even expanding to Brisbane and Sydney in 2015!). I didn’t know when I would be traveling to Hong Kong, so I thought, “why not check out this famous restaurant’s outpost in Singapore and see what all the hype was about? The restaurant states on its website that it never takes reservations. It’s clear why. There’s always a long line out the door. Either show up super early so you don’t have to wait too long, or be prepared to wait at least 30 minutes, if not over an hour. We came around 10:00 AM and only had to wait like 5 minutes or so. By the time we left the restaurant around noon, the line was well out the door. I guess it’s nice they put up chairs and ribbon barriers to control the crowds! They have gotten pretty good at managing the crowds. While waiting in line, you get a clipboard with the entire menu on it. This way, they can have your order early and even time it so that by the time you sit down, your food shows up not too long after. It’s a great way to get people in and out of there, fast! All over the restaurant (both on the menu and on colored placards at the table), they promote their “Big Four Heavenly King Dim Sum” dishes. These are their house specialties, the dishes they recommend everyone try. Since we didn’t know what to get, we were happy to try their top four dim sum items. This is baked charsiu bao (BBQ bun) and it was phenomenal – no question the best BBQ pork bun I’ve ever had. I loved the texture of the shell, which was a bit flaky, crumbly, and sweet. It’s like a Cantonese polo bun and a charsiu bao had a child. I loved the sugar encrusted top! The filling was also refined, with finely minced pieces of pork and vegetables. There was not a hint of big fatty pork pieces, gristle, or any of those other textural annoyances that make an ordinary charsiu bao not as fun to eat. Better yet, instead of using artificial coloring to make the interior look red (which is done virtually everywhere else), Tim Ho Wan uses red rice. This was definitely an elevated, Michelin-star quality bun. I kind of wished we had ordered more. It was sooooo good. I have always loved these rice flour based rolls. In normal Chinese dim sum, you usually order it with shrimp or beef. This version is unusual because it uses pig liver. If you’re not a liver fan, don’t order it. Bryan loved it, but I didn’t like it that much, mostly because the liver flavor is pretty pronounced. Objectively speaking, the quality of the dish was great, but I would personally stick to shrimp or beef next time. I have always loved getting turnip cake at dim sum restaurants. I also grew up eating a taro version, and Bryan grew up eating a pumpkin version (which I eventually learned how to make at home!). These turnip cakes were very good. I would say they were equal to other really good turnip cakes I’ve had in other parts of the world. They weren’t as mind blowing as the BBQ buns, but they were still top notch. 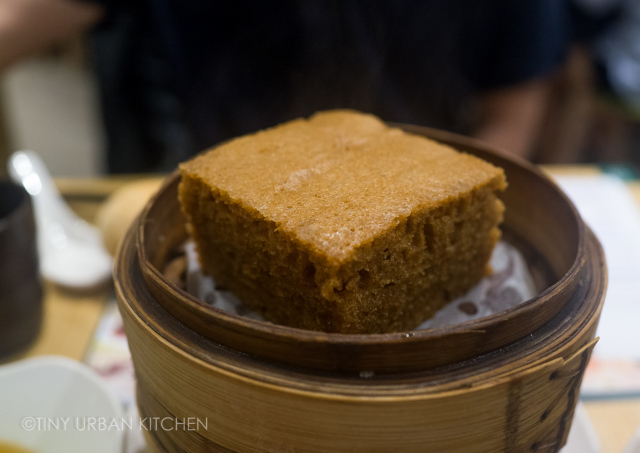 This delicate steamed cake reminded me almost of a sponge. I loved the dark, caramelized richness from the brown sugar. The cake was super soft, moist, and not too sweet. I loved it. Other dim sum dishes were excellent as well, like The Spinach Dumpling with Shrimp, a crystal dumpling with a potato starch skin that is delicate, slippery, and see-through. The shrimp was plump and juicy, and the overall flavor was delicious. Another crystal dumpling, the Teochew Style Dumpling, was also delicious, filled with all sorts of fun fillings like chives, peanuts, and other vegetables. In an effort to inject some vegetables into this meal, we ordered the Poached Fresh Seasonal Vegetable, which was lettuce. Surprisingly, it was really, really good! The barely poached lettuce was sweet, still just a tad crunchy, and had a really flavorful broth (maybe soy and bonito based?) poured over it which added a lot of flavor. The Squid with XO Sauce was displayed on another placard as a “Chef’s Recommendation”, so we tried it. It was pretty flavorful and solid. One of the more unusual dishes that they recommended (as a special), was this Cheesy Golden Yam with Dried Shrimp. I’m always surprised to see cheese on an Asian restaurant, especially cheese that looks like it came out of a Cheese Whiz bottle at a Michelin starred restaurant. I personally thought the dish was a bit weird and not that amazing. The fried yam cake was a bit dry, and it wasn’t like the cheese was that great quality. I would pass on this in the future. As we left the restaurant at 12PM, we saw the long line that had formed. Clearly coming at 10AM was a good idea. Not only did we avoid waiting in line, we now had the rest of the afternoon to do all sorts of other activities. All in all, the food here is very good and certain dishes, like the BBQ Pork Buns, are totally worth the hype. Seriously, if I came back again, I might just order multiple buns (for myself! ), maybe the simple poached vegetable (to counteract the rest of the meal? ), and some dumplings. I’d end with the steamed egg cake for dessert. And that would be enough to make me a very, very happy person. This is the 17th post in the Malaysia and Singapore! series and the first one covering Singapore. Other posts in this series include Lot 10 Hutong – Kuala Lumpur’s Most Famous Hawker Stalls Under One Roof, LaZat Malaysian Home Cooking, Otak, Otak Fish Dumplings in Banana Leaf, Little Penang Cafe + Visiting the Petronas Twin Towers, Roti Jala – Malaysian Lacy Pancake, Nonya Malaysian Chicken Curry. Bijan, Onde Onde, Jalan Alor -Kuala Lumpur’s Most Famous Food Street, Walking Food Tour of Kuala Lumpur, Mamak – Malaysia’s Indian Muslim restaurants, Hiking the Rainforests in Malaysia (and swimming the waterfalls!) with Open Sky Unlimited, Din Tai Fung, Marina Bay Sands, and Tian Tian Hainanese Chicken Rice. So funny. The “big fatty pork pieces [and] gristle” are why I like to eat charsiu bao. Well that and hello steamed buns. And I remember being disappointed recently when I had one on a trip to Vancouver that didn’t have that and the meat was more finely chopped. Now I know I was eating an objectively higher quality one. Thanks as always for this blog and for all your efforts in it.